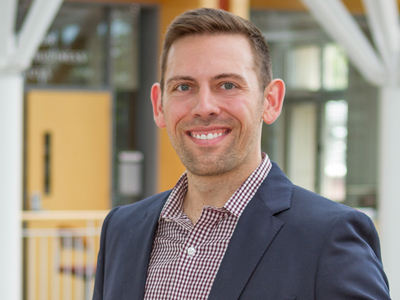 Joshua T. Beck holds a PhD from the University of Washington and is an Assistant Professor of Marketing in the Lundquist College of Business at the University of Oregon. He uses behavioral experiments and field data to examine factors that form and shape consumer-brand relationships, with interests in the domains of food, tech, and sports. His work has been published in Journal of Marketing, Journal of Consumer Research, Journal of Consumer Psychology, Journal of the Academy of Marketing Science, and Journal of International Marketing. Please refer to the CV for more information. Gish, Jeff, Lauren Lanahan, and Joshua Beck. " Entrepreneurial Activity from Income Inequality: Panel Evidence from The Craft Brewing Industry." Edelblum, Andrew, Joshua Beck, Sokiente Dagogo-Jack, and Lea Dunn. "Sit Back Or Act? How Self-Brand Connection Shapes Response to Brand Activism." Journal of Consumer Research. “The Role of Identification Needs in Shaping the Efficacy of the One-for-One Promotional Model,” with Riley Dugan and Joshua Clarkson, American Marketing Association Summer Conference, August 2017. “Marketing to Fans All Over the World: How Fan Identification and Social Context Jointly Shape Brand Sponsorship Effectiveness,” with Marc Mazodier and Conor Henderson, American Marketing Association Summer Conference, August 2017. “Soapbox Profits: How Brand Activism Impacts Abnormal Stock Returns,” with Yashoda Baghwat, Nooshin Warren, and George F. Watson, INFORMS Society for Marketing Science Conference, June 2017. “By the Grace of Brands: The Role of Brand Leadership in the Process of Restoring Control,” with Alexander Bleier and Ryan Rahinel, Association for Consumer Research Conference, October 2016. “Economic Inequality and Brand Performance,” with Colleen Harmeling, Yashoda Bhagwat, and Conor M. Henderson, American Marketing Association Summer Conference, August 2016. “Economic Inequality, Trust, and Brand Leadership,” with Colleen Harmeling, Yashoda Bhagwat, and Conor M. Henderson, Theory + Practice in Marketing Conference, May 2016. “Brands as Stewards: The Role of Brand Leadership in the Process of Restoring Control,” with Alex Bleier and Ryan Rahinel, European Marketing Academy (EMAC) Conference, May 2016. “Winning Me (Us) Back: How Self-Construal Shapes the Efficacy of Targeted Brand Apologies,” with Roseann V. Hassey, American Marketing Association Winter Conference, February 2016. “Norms as Standards vs. Self-Descriptions: How Dynamic Information Shifts Interpretation of Normative Messages,” with Sokiente W. Dagogo-Jack and Nidhi Agrawal, Association for Consumer Research North American Conference, October 2014. “Culture’s Impact on Relationship Marketing in BRIC Countries,” with Stephen A. Samaha, American Marketing Association Summer Conference special session with Jag Sheth, Olga Tretyak, and Aurea Ribeiro, August 2012. “Unpacking Loyalty: A Meta-analytic Review for B2B Relationships,” Special session: Emerging Interorganizational Issues, with George F. Watson IV, Conor M. Henderson, and Robert W. Palmatier, American Marketing Association Summer Conference, August, 2012. “Relationship Marketing,” with Robert Palmatier, B2B Authors’ Conference hosted by Edward Elgar Publishing, Ltd., Harvard University, August 2010. “Leveraging Groups,” with Robert W. Palmatier and Conor M. Henderson, American Marketing Association Summer Conference, August 2010. Beck, Joshua, Colleen Harmeling, Yashoda Bhagwat, and Conor Henderson. "Economic Inequality, Trust, and Brand Leadership." MSI Working Paper (No. 16-109). Watson, George F., Joshua T. Beck, Conor M. Henderson, and Robert W. Palmatier. “Building, Measuring, and Profiting from Customer Loyalty.” Journal of the Academy of Marketing Science 43, no. 6: 790-825. https://doi.org/10.1007/s11747-015-0439-4. Also published as an MSI working paper (13-120). Beck, Joshua T., Kelly J. Chapman, and Robert W. Palmatier. “Understanding Relationship Marketing and Loyalty Program Effectiveness in Global Markets.” Journal of International Marketing 23, no. 3: 1-21. https://doi.org/10.1509/jim.15.0010. Samaha, Stephen A., Joshua T. Beck, and Robert W. Palmatier. “The Role of Culture in International Relationship Marketing.” Journal of Marketing 78, no. 5: 78-98. https://doi.org/10.1509/jm.13.0185. Also published as an MSI working paper (13-117). Beck, Joshua T. and Robert W. Palmatier. "Relationship Marketing." In Handbook of Business-to-Business Marketing, edited by Gary L. Lilien and Rajdeep Grewal, 293-310. Northampton, MA: Edward Elgar. ISBN: 978-1-84980-142-3.